It might be difficult to pick your first paintball gun, especially if you don’t have enough information. 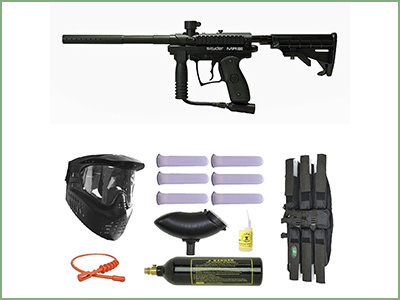 We will present the best beginner paintball gun picks to make your search easier. 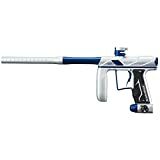 When picking a first paintball gun, there are a number of possible wants and needs you may have, and you may or may not have budgetary constraints. Therefore, we’ll cover guns in low, medium and high price tiers, as well as guns with various strengths and weaknesses. The guns covered in this article were chosen based on price, durability, ease of shooting experience, and the experiences of past users. Scroll down to discover the best beginner paintball gun of the year! The Tippmann Cronus is an excellent choice for a newer paintballer. It’s quite affordable, meaning that you wouldn’t have to commit to the gun before understanding what features you value most. And it’s a serviceable gun in all aspects important to the sport. User ratings back this up, with the Cronus receiving an average ranking of 4.3 stars out of 5. One of the main reasons that the Cronus is great for beginners is the fact that it shoots well. The gun has little recoil, and it’s easy to hold and balance. With a high-quality grip, the Cronus should allow newer players to fire as accurately as possible right out of the gate. The other big thing the Cronus has going for it is its durability. The Cronus has a design that enables it to survive hard play in challenging outdoor environments. You can expect a Cronus to last for nearly a decade with minimal care. Also made by Tippmann, the US Army Alpha Black is a solid choice for a beginner. Its price is toward the lower end of the spectrum, and it’s durable and looks good. The Alpha Black is popular among those who’ve used it, with an average ranking of 4.2 stars out of 5. The Alpha Black is especially notable for its appearance: It’s modeled after the M-16 assault rifle, including a removable magazine, front sights, and an adjustable stock. If you’re looking for a paintball gun that will simulate an actual warfighting weapon, the Alpha Black is about as close as you can come. The gun is also quite durable, and its long barrel can aid in accuracy for longer shots. The Alpha Black is a bit heavier than a number of other guns, so take that into consideration if that might be an issue for you. However, it’s still a solid candidate for the best beginner paintball gun title. Another fine choice for a beginning player is the Spyder MR100. The MR100 is similar in many ways to the Cronus, and is a bit more expensive but in the same general price range. The MR100 is well suited for outdoor paintballing and is generally seen as a quality gun, with an average ranking of 3.8 stars out of 5. One of the best features of the Spyder MR100 is that it’s an easily modifiable gun. This is especially good for a beginner because as you gain more experience with paintballing, you may decide you want to customize your gun in any of a number of specific ways. The MR100 is capable of being adjusted to your needs and specifications. You can find numerous Spyder MR100 upgrades, and they are usually very easy to install. Another plus with the MR100 is that its valve system is efficient, meaning you can fire a high number of shots with each CO2 tank. Another solid candidate for the best beginner paintball gun title is the MacDev Drone 2. If you’re willing to stretch your budget a little bit more, the MacDev Drone 2 is an outstanding gun. While it’s a little more expensive than many of the guns featured on this list, you’ll get what you pay for, as the Drone 2’s performance is considerably better than most of its lower-priced competitors. The Drone 2’s popularity is reflected in an average ranking of 4.4 stars out of 5. The Drone 2 is an incredibly light gun, weighing in at only 1.9 pounds. Its lightweight, combined with an ergonomically designed grip, trigger, and barrel structure, lead to a shooting experience that few guns can match. With high-end velocity, the Drone 2 gives you all the tools you need to fire where you want, as fast as you want, being ideal for as a beginner paintball gun. The Drone 2 also lends itself well to customization to your own desires or specifications. Another gun on the higher end of the price spectrum, the Etek 4 is a great gun if you’re willing to spend a bit more to equip yourself with a high-performance gun. For the extra price, you’ll be receiving a gun that gives all the bells and whistles that experienced paintballers are looking for. Those who use the Etek 4 are generally quite happy with it, with an average ranking of 4.3 stars out of 5. The Etek 4 has premium velocity and rate of fire, though it does come with a noticeable kick when firing. The gun is balanced and lightweight, and aside from the kick the experience of firing it is excellent. Where the Etek 4 really shines is in its high tech design. The Etek 4 can be programmed to a wide variety of firing modes and has a series of filters to prevent dirt and other debris from fouling the internal mechanism. 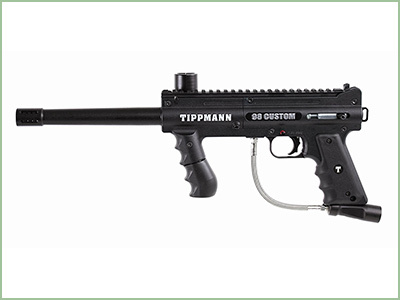 The Tippmann 98 is the most commonly rented gun around, and there’s a reason for that. The 98 has most of the features a beginner would look for in a gun: reliability, durability, and an affordable price. If you’re not looking to spend an arm and a leg while getting a solid gun, the 98 may be the gun for you. Reviews are generally pretty positive, with an average ranking of 4.0 stars out of 5. Much of what can be said about the Cronus or Spyder MR100 can be said about the 98. It’s a durable gun that you can use outdoors and should function well for years. The 98 offers a decent gun out of the box and can be customized in a variety of ways. 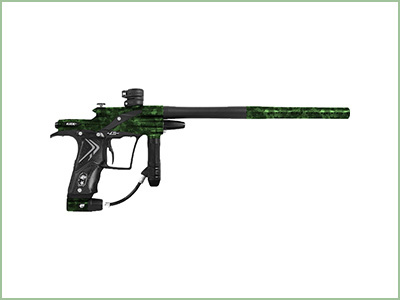 If you want to check out the sport of paintball without a massive cost commitment, the 98 is a fine choice. You can read more about the Tippmann 98 Custom in our extended review. The final gun on this list is another toward the higher end in terms of price. The Empire Axe is one of the very best guns on the market, and if you’re willing to pay a premium, you’ll receive top-of-the-line performance. With an average ranking of 4.3 stars out of 5, users are generally praising this gun. The Empire Axe provides an outstanding shooting experience, with very little recoil and a lightweight structure. The Empire Axe is especially noted for its ability to shoot large quantities of paint without breaking any paintballs. Allowing for programmable shooting modes, the Empire Axe allows you to fire it how you want to fire it, and offers a first rate shooting experience when you’re doing so. If you’re willing to jump into the paintball world while spending a decent amount of money, the Empire Axe is the way to go. 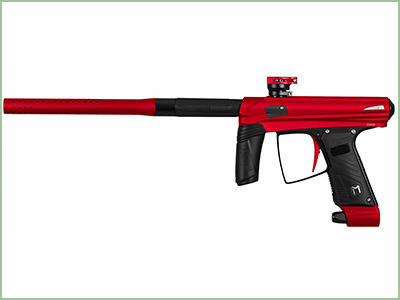 You can take a look at our Empire Axe review to see if this is the paintball marker for you..
Our list includes the best beginner paintball guns, weighted for ease of use, accuracy, durability, and price. In our opinion, there are two guns that stand above the pack: The Tippmann Cronus and the Empire Axe. If you’re willing to spend at the top of the line, the Empire Axe gives the best shooting experience money can buy. 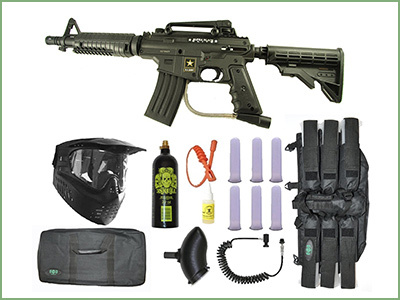 It is the best beginner paintball gun overall. 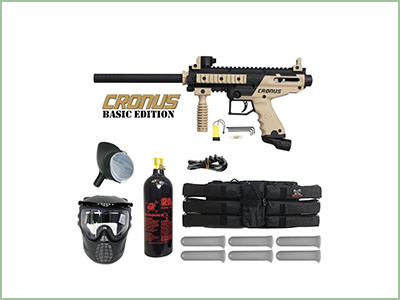 If you’re going to be more modest in your entry to the sport, the Cronus offers the best performance at a reasonable cost, being the best beginner paintball gun for people who don’t want to break the bank. Do you agree with the list? What do you think is the best beginner paintball gun? Let us know in the comments. I am a newbie and the US Army Alpha Black Tactical paintball gun seems to be easy to work with. Yeah it’s a bit heavy but that doesn’t bother me. In fact, I think most of these paintball guns are not light. We are also looking for comfort and ease of use, so your recommendation is great. Thanks for the feedback! 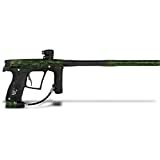 Of all of the best beginner paintball guns around, I would say that the Spyder MR100 is the best. It was very user friendly and highly efficient. Even though it was costly, it was most definitely worth it. I am pretty good at it thanks to Spyder. That’s lovely to hear! The Spyder can truly be a revelation! The US Army Alpha Black Tactical paintball gun is pretty awesome though it’s heavy. That’s my only complaint about it. Otherwise it’s great and works better than so many others. Especially the Spyder. Didn’t like that one really at all. Thank you for sharing your opinion, we love to see passionate people willing to spread their knowledge. I like the Tippmann Cronus much better than the Spyder. It’s more durable, powerful and better for those who are starting out. It’s easier to handle. Though that’s just my recommendation. You have to do your research and get a feel for it. We also think that Tippmann is one of the best brands in the game. Thanks for sharing your opinion. 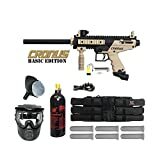 The Tippmann Cronus is a great paintball gun if you are just starting out because it is so simple to use and to work with. I don’t recommend trying any other type of paintball gun to use if you have never used one before in your life. Thank you for your advice! Our beginner readers will surely appreciate it! If I were to say what the best beginner paintball gun would happen to be, I would most definitely say that the US Army Alpha Black Tactical is the best one for newbies. I found that to be the case personally anyway. Thanks for your feedback. Which other guns have you tried? Why does the average ranking of the Spyder MR100 only 3.8 out of 5? I am shocked because it is a good paintball gun and definitely the best one for beginners to try out. What is it that people did not really like about it? Thank you for taking the time to share your opinion. Some users complain about loose parts or customer support. We consider these to be isolated events, so we included the Spyder MR100 on our list as it does the job well, in our opinion. When I started paint balling I got the US Army Alpha Black Tactical paintball gun and I found it to be great, and quite user friendly. I think this is a good one for any newbie to start with as it makes the experience easy and more enjoyable. Thanks a lot for sharing your opinion with our readers. Yep, the Cronus paintball gun is super easy to use. I have not tried the others listed here but I used that one and still do and I like how newbie friendly it is. And I can keep using it even after having experience. Oh yeah the Tippmann Cronus paintball gun rocks and it is most definitely ideal for newbies to paintballing. It is so incredibly user friendly and durable how could anyone even complain about it at all? Highly recommended in my books.